Songwriter, lyricist, and classically trained composer and conductor Diane Louie has a dense resume of work with recording artists such as Stevie Wonder, the Backstreet Boys, Snoop Dogg, Tony Bennett, and Christina Aguilera. She’s provided musical direction and written songs for TV shows including The Tonight Show, American Idol, the Grammys, and the NAACP Image Awards. She’s helmed orchestras worldwide, including the London Symphony, the Boston Symphony, the San Francisco Symphony, the Detroit Symphony, and the Royal Philharmonic. United Nations General Assembly Hall, NYC. Photo by Bruce Zinger. United Nations General Assembly Hall, NYC. Photo by Bruce Zinger. 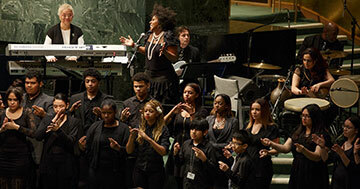 St. Francis de Sales School for the Deaf, #47 ASL and English Secondary School; DML, music director; Pauletta Washington, vocals; Richard Hammond, bass; Naghmeh Faramond, percussion; Abe Fogle, drums. Not pictured: Raymond Harris, trombone; Greg Blair, woodwinds; James Cage, trumpet; David Connolly, director for Mamazband; Corine Frick, producer for Mamazband; John David Washington, producer for Mamazband. Arts education cannot be left out of the push for equity, Louie argues. “Art is as essential as our physical needs,” she says. “How do you take care of the non-visceral part of yourself, the abstract? It has needs, and the most basic is the need to express itself.” Such expression requires developing good tools and techniques, which is why education is essential.